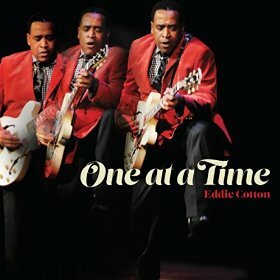 I just received the newest release, One At A Time, from Eddie Cotton and it's a great followup to his first release, Here I Come which was on my favorites list from last year! This release is off and running from the start with title track, One At A Time, a soulful blues track with Cotton on vocal and hot guitar riffs. James "Hotdog" Lewis , who passed away only a week ago today adds some real nice keyboard work on this release.With Myron Scott laying down a nice bass line and Samuel Scott Jr. on drums this track is moving, nicely complimented by Kimble Funchess on trumpet, Jessie Primer III on sax and Mike Weidick on trombone. Very nice! With it's super walking bass line by Bennett, Be Careful has a classic blues sound but with a definite R&B overtone. Cotton has a great voice and Carlos Russell adds harp giving it a cool contemporary feel. People keep commenting that we have to keep the blues alive. This is positive proof that all you got to do is play good blues and it will spring to life. Super! Slow blues number, Better Deal gives Cotton a real nice opportunity to lay it all out and that's exactly what he does. With a hot and crispy extended guitar intro, Cotton sets the fire and with his vocals he fans the flames. Hotdog's contributions on this track add a lot of texture and Bennett's bass sets the stage. Cotton has a real nice ability to play under the lead vocal with hot guitar riffs keeping you on edge awaiting his solo and he doesn't disappoint. Cotton is fluid and emotional with a great feel for phrasing. Excellent! Catch I Wanted is funky with cool horns and Al Green like vocals. Hi steppin and happy, this is a great track! R&B track, Dead End Street, has really nice harmonies with JJ Thames who's release Tell You What I Know was also on my favorites list last year! A smooth and mellow track with strong radio potential. Texas style, Fair Weather Lover, shows Cotton's influence by Albert King with strong stinging guitar riffs and phrasing. This is one of my favorite tracks on the release with a perfect balance between Cotton's vocal and solid guitar riffs. This guy is sorely underrated as a guitar player with clear, fresh phrases and stinging punctuation. Funky, Filling Me With Pleasure, finds Cotton on slide and Mayfield like falsetto. Bennett again gives the track spring and Hotdog and the Jackson Horns punch. Lumbering blues track, Hard Race To Win, again rides tight on the back of Bennett on bass. Cotton knows how to lay back and sing the blues with a solid platform under his feet and injecting clever riffs of texture. I really like his style and the little pieces of history I hear in his delivery. His vocal phrasing even hints at James Brown. Je Ne Sais Quoi has a real nice strut that defies you to sit still in your seat. Hotdog rides hard on the organ giving it a spiritual quality but Bennett digs in on bass making you bob you head. Cotton's smooth vocals and easy rhythm guitar is just right. Shuffle track, Mississippi, is uptempo BB King style without the fist clap. Cotton is showing that he has what it takes to be today's top blues performer with Russell and John Genous on backing vocal. Hotdog rides the wave on keys and Cotton stylistically grooves along on guitar over the melody. Very nice! On more casual blues number, My Money, Grady Champion who's last release Bootleg Whiskey was reviewed here as well, joins on harp. This track has a real nice blend of Hotdog's excellent piano riffs, Cotton's clever guitar riffs and Champions harp texture making it a real easy going blues number. Getting back into the R&B styling, Ego At Your Door, is a super track with very strong backing vocals from Thames. Hotdog again on organ gives the track excellent warmth and the Jackson Horns do a real nice job of giving the track it's wind. I really like this track and it's gospel R&B style roots. Excellent! Race To The Dollar has a real nice fusion of R&B and blues with Al Green style vocals and SRV style guitar riffs. Cotton has his own voice and his own style but keynotes to the past are his stepping stones. Very nice job! Wrapping the release is a solemn blues number, War Is Over. Cotton musters the most soulful vocals on the release on this track and his guitar riffs are light and tasty. With a solid bass line from Bennett, simple keyboard tension from Hotdog and straight drum line from Scott this track is wide open for Cotton to place his shots just where he wants them. Confidently placed and soulfully expressed, this track is an excellent closer to an excellent release!